When Dr Charles H Kellaway arrived from London in 1924 to accept the directorship, his priorities were to acquire a cadre of aspiring scientists for the institute, and to raise money to supplement the £2,500 per annum provided by The Walter and Eliza Hall Trust. 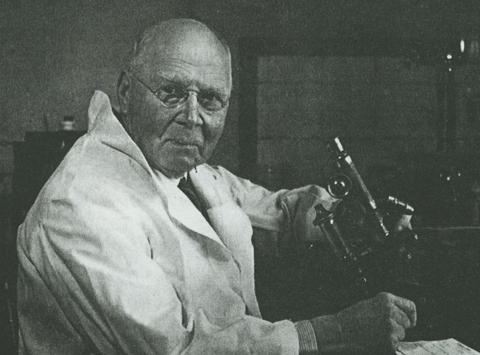 In addition to several other new income streams, in 1927 Dr Kellaway obtained the first direct funding for medical research from the Commonwealth Government. This provided a precedent for the development of an organisation dedicated to distributing government funding of medical research, the National Health and Medical Research Council, in 1936. Dr Kellaway established three departments: physiology, headed by himself; biochemistry, headed by Dr Henry Holden; and bacteriology, headed by the young Dr (later Sir) Frank Macfarlane Burnet. In 1925, Dr Kellaway sent Dr Burnet to the Lister Institute, UK, where he worked on bacteriophages and secured his PhD. Upon his return, Dr Burnet continued to make seminal discoveries in bacterial and phage genetics but moved more and more into virology. Together with Dr (later Sir) Neil Hamilton Fairley and Dr (later Sir) Harold Dew, Dr Kellaway focussed on hydatid disease and venoms of Australian snakes, spiders and mussels. Sir Hamilton Fairley went on to a major career in tropical medicine, first in India and then in London and was responsible for a program of prophylactic antimalarial treatment that was critical for the Australian armed forces during the World War II. Four of Dr Kellaway’s small staff - Dr Wilhelm Feldberg, Dr Neil Hamilton Fairley, Dr Burnet and Dr Kellaway himself, in 1941, were eventually to be elected Fellows of the Royal Society. In 1928 Dr Kellaway was appointed chairman of the royal commission investigating the Bundaberg tragedy, in which 12 children in Bundaberg, Queensland, died following vaccination against diphtheria. There was intense public interest in the issue and Dr Kellaway led a thorough investigation of the causes of the tragedy. This raised the profile of the institute and impressed the importance of medical research more firmly into the public consciousness. influenza virus, a technique still in use today. Dr Kellaway adroitly steered the institute through the Great Depression, avoiding the threat of closure, and by 1939 it was producing high quality results. With the outbreak of World War II, Dr Kellaway shifted the institute’s interests to include infectious agents affecting Australian soldiers in the tropics. Mindful of the devastation caused by the flu pandemic following the previous war, Burnet became deeply involved in trying to develop an effective flu vaccine. When the Melbourne Hospital - now The Royal Melbourne Hospital - moved from Lonsdale Street to its new premises in Parkville, Dr Kellaway seized the opportunity to gain new, custom-built laboratories in a wing abutting Royal Parade. In 1944, he accepted an invitation to head the research laboratories of the Wellcome Foundation Ltd in London, and Dr Burnet was appointed the new institute director. Sir Macfarlane Burnet later wrote that Kellaway’s influence on the direction of the institute “set Australia on a new path to achievement in medicine”.